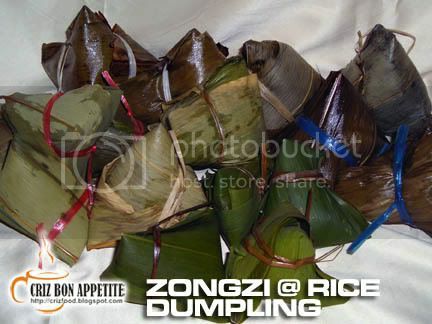 Zongzi or rice dumpling is traditionally eaten during the Dragon Boat Festival (Mandarin: Duanwu; Cantonese: Tuen Ng) which falls on the fifth day of the fifth month of the Chinese calendar. The celebration happens to fall on today, 8 June 2008. These zongzi are wrapped with bamboo leaves and left to boil for several hours in order to get the glutinous rice to cook well. 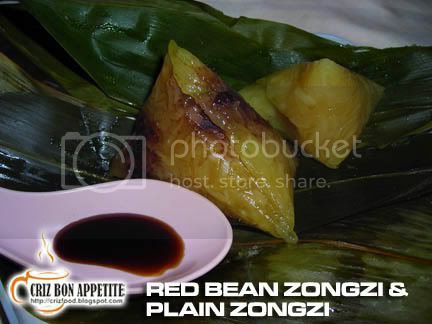 I will show you the many types of zongzi which are easily available in Penang during this celebration. 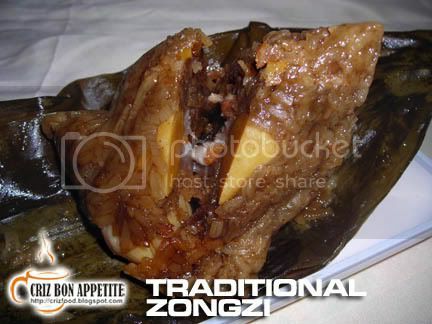 Firstly, let’s look at the traditional zongzi which has the glutinous rice pre-fried with soy sauce, dark soy sauce and pepper prior to boiling. The rice is then wrapped together with salted duck egg yolk, pork, mushrooms, water chestnut and dried shrimps. 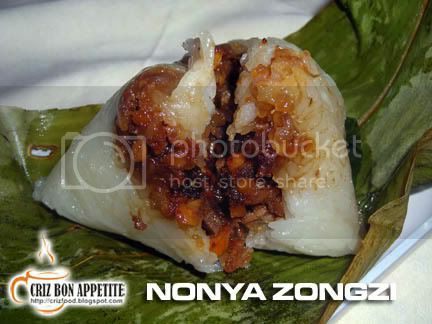 The Nyonya Zongzi is totally different. It has pounded groundnuts, sweetened winter melon, some pork, dried shrimps and cooked with some spices. Normally, a small piece of pandan leave is added while wrapping to give it that special fragrance. 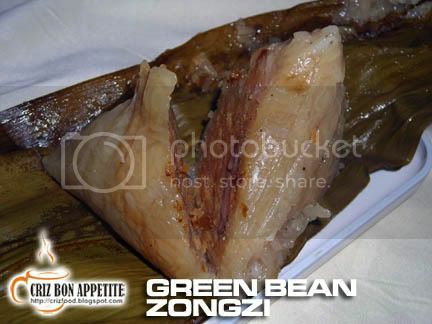 Another variety of the zongzi is the Green Bean Zongzi. It is normally filled with boiled beans and some fatty pork. Sometimes, the maker will also add in some salted duck egg yolk. Normally these zongzi will be eaten with chili sauce or fine sugar. There will also be the Jianshui Zongzi where the zongzi are treated with lye water to get the yellowish color. 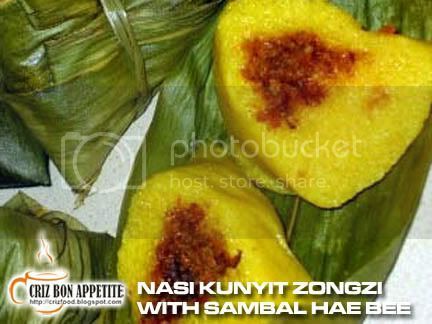 These zongzi are eaten with Gula Melaka (Palm Sugar) cooked with some santan (coconut milk). Some people will even fill the zongzi with sweeten red bean paste. I happened to come across a new version of zongzi which is the Nasi Kunyit filled with Sambal Dried Shrimps from Lily Ng’s blog. She even provided us with the recipe for making them. Criz, I haven’t come across the nasi kunyit filled with sambal hae bee dumplings in Pg.